Quiet and efficient comfort is what you get with a Rheem Prestige Series Gas Furnace. The new patented heat exchanger design provides improved airflow, which reduces operating sound by 20%**. The variable-speed ECM motor also contributes to a quiet, more efficient operation. It’s engineered to provide better humidity control while using less power. Overall, this is one of the quietest furnaces on the market. And because it’s high-efficiency, your monthly energy bill will benefit, too. Reliability is of the utmost importance when it comes to your home’s comfort. Our Prestige Series Gas Furnace comes standard with the Rheem-exclusive PlusOne Ignition System. This proven direct spark ignition (DSI) is one of the most reliable ignition systems available today. Used exclusively by Rheem in the Heating and Cooling industry, this proven technology is also used on ovens and stoves — appliances that you rely on daily to ignite. Protect your home with our PlusOne Water Management System. The industry’s first blocked drain sensor will shut off your furnace when a drain is blocked, preventing water spillage and potential water damage to your home. All this and one of the best warranties in the industry translate to fewer repair bills and more cozy nights at home. Easy installation and maintenance features benefit consumers, too. This means savings on installation costs and maintenance. The Rheem Prestige Series Gas Furnace is designed with PlusOne Diagnostics — our industry-first, 7-segment LED display that makes service calls quick and easy. 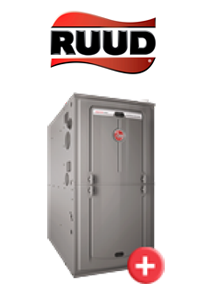 The R96V Rheem Prestige Series Gas Furnace is not only high-performing, it also saves you energy and money. A 96% AFUE rating may qualify you for local and/or utility rebates. It’s everything you need in a gas furnace — and more. Energy Savings are a welcome bonus to any heating system. Maximum airflow and a patented heat exchange design mean the Rheem Prestige Series Gas Furnace uses fuel efficiently and economically. It gets an ENERGY STAR® rating for maintaining comfortable temperatures while reducing energy consumption and lowering utility bills. and get ready to reap the rewards of choosing the best for your home.